The secret to real, functional strength resides in body weight exercises and core workouts, and these are best when instability is introduced to the exercise. 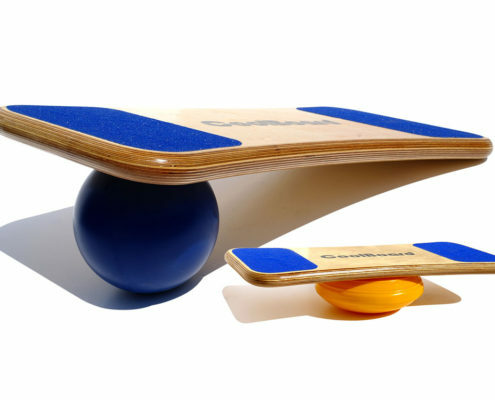 More effective than a swiss ball or half ball, CoolBoard balance board is on a par with suspension training, but more accessible, more fun and less hassle. CoolBoard safely provides more instability than any other product, so will work your body harder and more effectively than anything else. A ‘simple’ press-up suddenly engages much of your body and core as you keep the CoolBoard steady through the move – you will find muscles you didn’t know existed! Your workout can be strength or cardio biased – your choice. CoolBoard is progressive. Start exercising on our Disc which provides movement similar to a Swiss Ball or Half Ball. Then progress up to using CoolBoard on our Ball to get unrivaled movement for a harder workout. Due to this progression, we have shocked Marines with a few press-up, but also helped the elderly get some strength and fitness back for a more active life. By always working your core, joints, balance and proprioception you will also prepare your body to avoid injury as best you can so you can avoid forced time away from training. 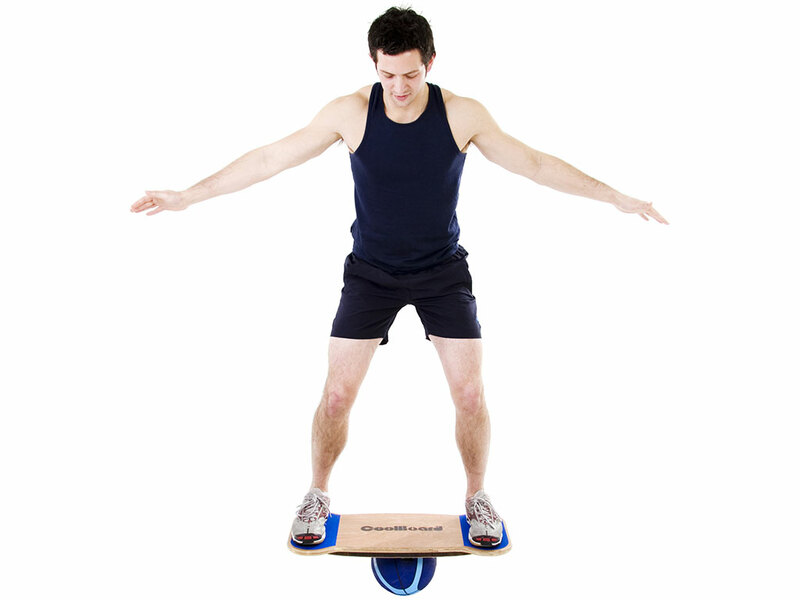 Effective Results Fast – The world’s only true 360° balance board CoolBoard provides more instability than any other product, so will work your body harder and more effectively than anything else. After a week I can do much more on it (though there’s still a way to go…) and I can feel the difference already on balance, strength and fitness. Whatever your sport, whatever your level – Core Strength and Stability, Balance, Proprioception, and Joint Strength – are all training goals that are vital in modern sports performance for good reason. With its unrestricted instability CoolBoard will help you target these vital elements of your fitness like nothing else – but why are they so important? Your Core connects all your major body parts and is where all your power of movement begins. Balance and proprioception are the systems that your body uses to control itself – think about running or catching a ball and how little thought these tasks require. Your joint stabilising structures give you the strength to control and move a limb with accuracy. Having strong joint stabilising structures and core will allow you to move your body with more strength, power and accuracy for longer = performance! Instability training works these often under-developed areas of fitness, and because CoolBoard offers more instability than other trainers (half ball, other balance boards, swiss and gym balls, foam pads, etc) its far more effective – you must react to every little movement, constantly working all those little important muscles. 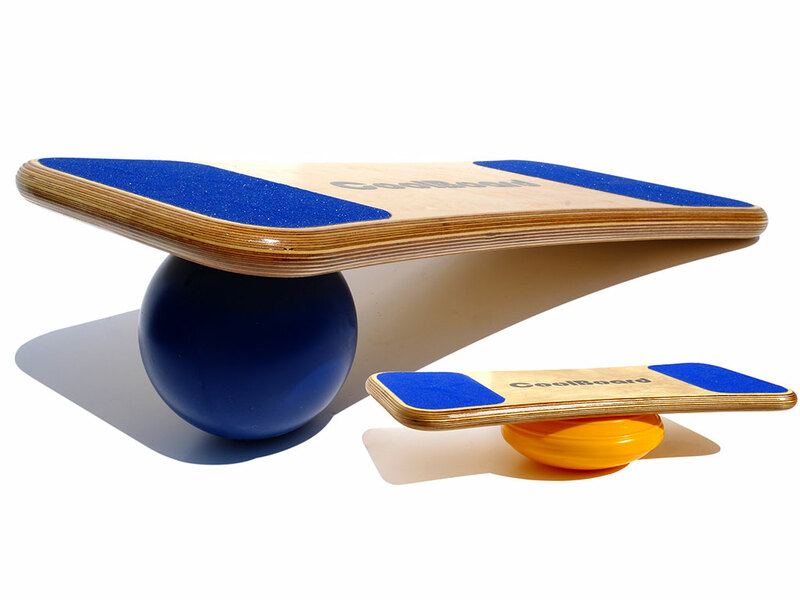 Just balancing on CoolBoard balance board fires up most muscles from your toes to your chest, including the all important joint stabilisers and core… our other 70 body weight exercises will allow you to further target these as well as working your upper body. We already have 12 Sport Specific workouts to choose from, with more to come. Working muscles you didn’t know you had, CoolBoard will nip and tuck you to perfection, while building solid muscles and helping you to lose weight. 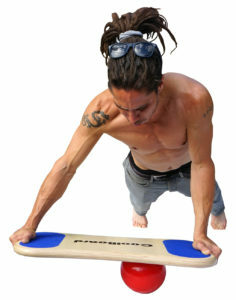 The unique movement of CoolBoard means while you are doing a body weight exercises, the board is always trying to move and you’re always working to hold it steady. This means CoolBoard use will burn many calories while always engaging your core and toning you from head to toe. By working your core strength and the strength of your joints you will tone areas most people don’t even realise exist. So all the subtle areas around your joints and midriff will nip and tuck giving you that truely athletic look. Working your balance and proprioception will help you to hold yourself with more poise and confidence helping you to look your best and show that body off. If tone is what you want – try our 7 step exercise workout (free with every package) – a few sessions a week and you’ll love it, its so effective and quick, a 10-15 minute session every morning and night and your friends won’t believe it! If muscle bulk is what you’re after – CoolBoard will give you the core and joint strength along with the control to push heavier weights leading to faster and safer muscle building. Should you ever want to it will also give you the control to use that muscle to its full potential with less chance of injury. Whatever the reason you want to get fit for, improving our bodies always comes with the risk of injury. CoolBoard use can help to reduce the chances of injury – known as pre-habilitation, as well as help to recover from injury – rehabilitation. It is well documented that increasing core strength and stability, increasing the strength of the muscles and tendons that support our joints, and improving balance and proprioception are essential in both Prehabititation and Rehabilitation of many common sporting injuries.